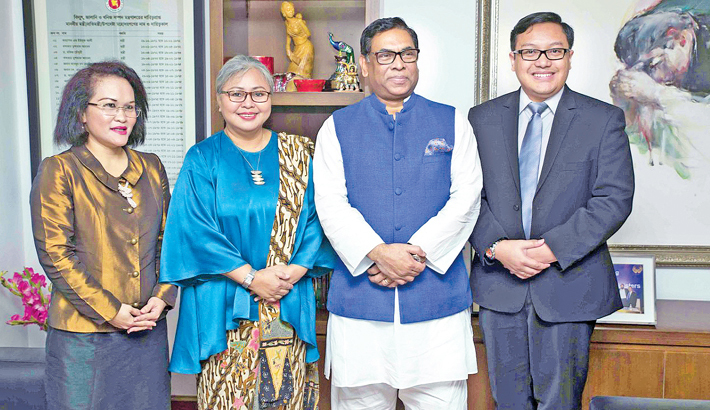 State Minister for Power, Energy and Mineral Resources Nasrul Hamid is seen with the newly-appointed Indonesian Ambassador in Dhaka Rina Suemarno at the former’s secretariat office in the capital on Wednesday. Indonesian Ambassador to Bangladesh Rina Suemarno on Wednesday said that her country is interested to export coal and LNG along with construction of FRSU. "The Indonesian public and private sectors are interested to work in the Bangladesh's power and energy sector," she said while paying a courtesy call on State Minister for Power, Energy and Mineral Resources Nasrul Hamid at the latter's secretariat office in Dhaka, reports BSS. The newly appointed envoy said Indonesia is interested to export coal and Liquefied Natural Gas (LNG) to Bangladesh along with construction of the Floating Storage Re-gasification Unit (FSRU). During the meeting the state minister and the Ambassador discussed various issues related to mutual interests with particular emphasis upon Bangladesh' power and energy sector. The envoy also said that Indonesia is willing to invest in the poultry, cement and pharmaceutical sectors under joint venture by utilizing Bangladesh experience. "We are willing to expand our cooperation," she added. The state minister welcomed the newly appointed Indonesian Ambassador and said initiative might be taken to promote coal, LNG and related businesses with the brotherly Muslim country. "We need huge quantity of coal. By identifying the areas of cooperation, we can jointly frame a development framework. Tradeshow or seminar between the two countries' businessmen could increase the bilateral trade," Nasrul said. He, however, said the government is encouraging business under the government to government arrangement (G-2-G).